Oh, how I love being a newborn photographer! Meeting all these fresh little babies…there is truly nothing better! Miss Izabella came in for her session at 13 days new and while she was quite perky for the first bit of her session, once she feel asleep she was really out! 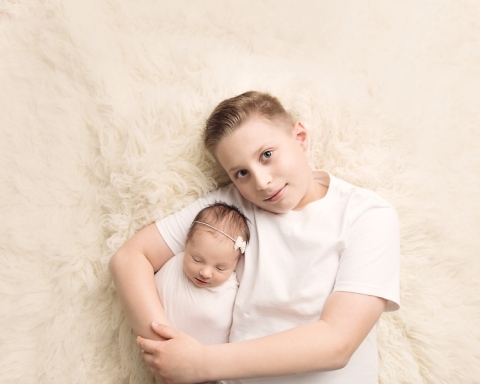 Izabella’s big brother was so sweet and funny, it’s not too often that the older siblings are as calm and patient. He really made this session a breeze! And aren’t they so sweet together? Melts a momma’s heart for sure! Family photos at a newborn session are always a must. They are so intimate and during such a magical time in life. It’s not too often we welcome a new family member! This blanket mom and dad brought to the session and was made by her grandmother. I love when clients incorporate special items into their sessions. What a sweet sentiment. There’s just something about this little bunny from Mary’s Knittin that keeps me coming back for more! Pink on pink on pink, oh swoon! The little bed from The Original Photoblock Props is always a favorite. Simple and the perfect size. I always get asked if I make my props, I wish that I could be that crafty! I like to leave the craftiness to the professionals. Thank you so much for stopping by! If you like what you see, please share the post or feel free to look around the website. Gift certificates make the perfect gift for new parents. What could be better than photos of your little one to last a lifetime? Looking for a newborn photographer? Please check out other newborn sessions on the blog. Each session is as unique as your little one, please contact Mary to learn more about the newborn sessions.